Aftermarket specialist gives stylish SUV a comprehensive makeover. The Q8 is already one of the most aggressive-looking crossovers Audi has made to date. But at the 2019 Geneva Motor Show next week, one of the top tuners of Ingolstadt's finest will present an even more aggressive take on the rakish high-rider. 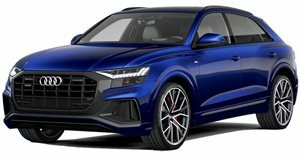 Abt Sportsline's take on the Audi Q8 starts with the top diesel model. But instead of 286 metric horsepower and 442 lb-ft of torque, Abt has cranked the output up from the 3.0-liter turbodiesel V6 to 330 hp and 479 lb-ft, all thanks to a remapped engine control unit. That's a whole lot of muscle – almost as much power as the gasoline model, and much more torque. But the tuner didn't stop there. It's also revealed a full body kit, complete with front lip spoiler, ear skirt, fins... the works. The whole thing rides on a set of 22-inch wheels – Abt Sport GR units, which the tuner will also showcase in 23-inch diameter for the truly extroverted. And the oversized rims are mounted on a retuned air suspension. Inside, Abt has spruced up the cabin with carbon-fiber shift knob, shifter gate, and even seat frames. The Geneva show car is also fitted with projector entrance lights and a metal start/stop switch cover. Nice work, all around, if you ask us. And it just goes to show that as far as the Germans are concerned, diesel isn't quite dead yet – controversy or no controversy. At any rate, it ought to satisfy buyers who've been eagerly awaiting for the manufacturer to come out with an S or RS version of its new flagship crossover.